Waste Land is a 2010 British-Brazilian documentary film directed by Lucy Walker. The film chronicles artist Vik Muniz, who travels to the world's largest landfill, Jardim Gramacho outside Rio de Janeiro, to collaborate with a lively group of catadores of recyclable materials, who find a way to the most prestigious auction house in London via the surprising transformation of refuse into contemporary art. The catadores work in a co-operative founded and led by Sebastiao Carlos Dos Santos, the ACAMJG, or Association of Pickers of Jardim Gramacho, who dreamed of improving life for his community. The money created by the selling of the artworks was given back to the catadores and the ACAMJG, as well as the prize money from the film awards, in order to help the catadores and their community. 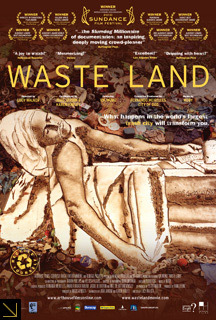 The film premiered at the 2010 Sundance Film Festival and went on to be nominated for the Academy Award for Best Documentary Feature, as well as win over 50 other film awards including the International Documentary Association's Best Documentary Award, which was handed to director Lucy Walker inside a garbage bag. The documentary was produced by Angus Aynsley and Hank Levine, executive produced by Fernando Meirelles, co-directed by Joao Jardim and Karen Harley, co-produced by Peter Martin, and photographed by Dudu Miranda. The music was created by Moby, who is a friend and frequent collaborator of Walker. Waste Land received unanimously positive reviews as "an uplifting portrait of the power of art and the dignity of the human spirit."